The EZ Money utilizes a 4-Piece multi-density core and the WOW particle coverstock. The WOW particle is new technology in coverstocks that produces more overall hook in the oil and increased energy retention down the lane. Yes, a shell that produces more hook and the "around the corner reaction" that bowlers like to see on today's modern lane conditions. This core and coverstock combination will create a later break point and a stronger backend compared to its counterpart, the Money. 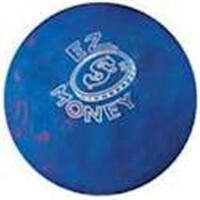 Due to the time it takes to produce the Track EZ Money ball it will ship in immediately. We cannot ship this ball outside the United States.